Velocity, the choice is yours. Every year in November there is a book fair in my hometown. I love going there, it is a great way to find and buy books for a lower price than usual. And you might arrive home with a couple of surprises. I always come home with at least a couple of books – I try to keep it in check – mostly English novels, a lot of them at really nice bargain prices, paperbacks for one or two euros. And not just books from author’s no one knows but also the big names. This was one of those books, I think the prize I pealed off it before I started reading it was one fifty or one seventy-five. It’s a great way to find books, they have a lot of interesting books, books which you might not have bought if it weren’t for this fair. I had heard of Dean Koontz but I don’t think that I ever read any of his books. I do have another book but that one is on my to-read list as well. And since this is only my fifth book this year I still have 45 open spots for the rest of the year. So I’m pretty sure I get to that book one day, especially since I really enjoyed reading this particular story. On the back of the book it says a read-in-one-go novel. I can’t really agree with that because the book has 498 pages and my attentions span is not that long, however I do have to admit that the story really pulled me in. And I had trouble putting it down and I might be guilty of staying up too late because I was reading and didn’t want to stop. If you don’t take this note to the police, I will KILL a lovely blonde schoolteacher somewhere in Napa Country. If you do take this note to the police, I will instead KILL an elderly woman. You have SIX hours to decide. 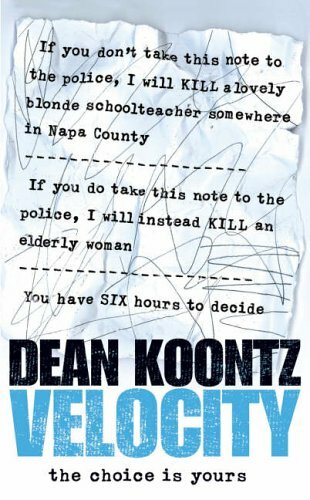 Velocity is the title of the book and that definitively describes the way the story develops. It goes fast. The whole story takes place in a couple of days – Monday to Thursday, I think – and a lot happens in this story. A few times a really good curve ball is thrown and what seemed logic before suddenly seems highly unlikely. That is what I like about books. This reading challenge is really about opening up and broadening my horizons. I want to read different kind of books, also things which I might not have thought about before. So different authors and genres both in Dutch as well as in English. And who knows maybe I might try my hand at reading something in German. I’m pretty sure I can read it and understand it, so why not give it a try. Anyway, if you have something you think I might want to read. Let me know and I will see if I can get my hands on it. And eventually write a review about it.